If you want to truly experience the outdoors in Cookeville, Tennessee, you’re going to need to bring your entire gear closet. The town, located just over an hour east of Nashville in the north central part of the state, is surrounded by majestic mountains and features a rich cultural heritage. The region’s diverse landscape plays host to just about every type of outdoor recreation you can imagine. From hiking and running to paddling and swimming, the list of scenic destinations and thrilling adventures to be found in and around Cookeville goes on and on. While there are dozens of reasons to visit Cookeville if you love the outdoors, we’ll get you started with these eight...and let you discover the rest. From broad rivers to city parks, Cookeville offers an array of flatwater paddling options. Nearby Fall Creek Falls State Park features some of the most peaceful boating in the Upper Cumberland area, with plenty to explore on Fall Creek Lake. Visitors can bring their own non-motorized boats or rent them in the park. Another fantastic option is Center Hill Lake, which offers several launch sites and beaches that are perfect for paddling a day away. Closer to town, City Lake Natural Area is a favorite for floating and fishing. Tip: Be sure to take the short hike from the parking area to see one of the region’s many waterfalls. From Cookeville, it’s a quick drive to the southern section Big South Fork National River and Recreation Area, an enormous preserve encompassing 125,000 acres of the Cumberland Plateau. Big South Fork has an adventure for every outdoor lover, from hiking and biking to whitewater rafting and caving. For boaters, the recreation area is home to the Big South Fork Canyon, the Cumberland River, and Big South Fork Gorge, which are all excellent whitewater destinations. Guided rafting trips are available with options that are perfect for the whole family. For those who wish to explore on foot, there are more than 150 miles of hiking trails woven throughout the area, including some leading to the largest group of sandstone arches in the eastern U.S.
With an average elevation of 1,400 feet, the Cumberland Plateau is a geographic wonder. Over millions of years its many streams and rivers have carved deep ravines and gorges throughout the sandstone landscape, creating hundreds of unique and beautiful waterfalls all around Cookeville. While Cummins Falls is a well-known swimming hole, nearby Waterloo Falls is a hidden gem that is easily accessible offering a refreshing retreat. Take a waterfall tour around the region. Cookeville boasts more than 150 falls within approximately 40 miles from downtown; Virgin Falls, Lost Creek Falls, Fall Creek Falls, Twin Falls, and Ozone Falls, just to name a few. Tip: If visiting Virgin Falls or Lost Creek Falls, be sure to detour to the spectacular views from Welch’s Point. In addition to beautiful waterfalls and scenic overlooks, Rock Island State Park, just southwest of Cookeville and home to champion kayaker Eric Jackson, offers world-renowned whitewater paddling on the Caney Fork River. While the section of runnable water in the park is fairly short and can be completed in about an hour, it features Class III to IV rapids and is not suitable for beginners. While the paddling is great, the stunning scenery of the river gorge makes it even better. For non-boaters, it’s well worth a visit to Rock Island to watch expert paddlers test their nerve freestyle kayaking at Twin Falls, just below the Great Falls Dam. The Cookeville area is home to a variety of outdoor-themed events to suit every interest. For runners, the Cummins Falls Marathon (which also features a half marathon, 10K and 5K) is a challenging but beautiful run on rural back roads to benefit the state park. Other annual races include the Upper Cumberland Haunted Half Marathon, and the Summer Splash 5K. Also, cyclists can take part in the Cookeville Criterium bicycle race, which passes through the historic downtown square. Cyclists up for an elevation challenge can experience the Cub Mountain Ride to the Sky, an annual bike ride offering distances from 20 to 80 miles. Nearby in Edgar Evins State Park, fun and educational events are held year-round for the whole family to become immersed in nature. Some of these great programs include Wildflower hikes, swimming hole tours, sunset cruises, kids fishing tournaments, and more. There are also several fantastic festivals in the Cookeville area each year, such as Muddy Roots Music Festival, Caney Folk Music & Arts Festival, Fall FunFest, WCTE's Blues & Brews Craft Beer Festival, Jammin at Hippie Jack’s Americana Music Festival, and, of course, Bonnaroo Music and Arts Festival nearby in Manchester. Planning the perfect post-adventure meal is almost as important as planning the adventure itself. If it’s beer you crave after a day on the trail, head on in to Jig Head Brewing Company, Hix Farm Brewery or Red Silo Brewing Company for a great selection local craft beers. If barbecue is your after-adventure craving, you can’t beat The Blue Pig and its artfully prepared meats and sides. For lighter fare like salads, sandwiches, and brunch, grab a table at The Back Room Bistro for fresh, local ingredients and scratch-made dishes. If you want the true, down-home Cookeville experience, though, swing through Spankies Restaurant and Bar for live music, friendly service, and a vibrant atmosphere. There is no shortage of places to get some serious fishing done in and around Cookeville. One of the most well-known destinations is Dale Hollow Lake, an Army Corps of Engineers waterway. This pristine lake is home to world-class bass fishing and is also great for paddling, water skiing, and swimming. Standing Stone State Park has a beautiful fishing hole called Kelly Lake, where anglers can reel in bass, trout, bluegill and catfish. Other nearby fishing options are Cordell Hull Lake, Center Hill Lake, and Burgess Falls State Park. While that may sound like several years’ worth of adventure, it’s just the tip of the iceberg for the outdoor scene in Cookeville. Whether you prefer gnarly paddling, gentle hikes, or just hanging out in a beer garden, you’ll find something to love high up on the Cumberland Plateau. 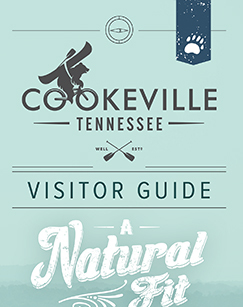 Head to Cookeville for your next getaway and begin discovering all that it has to offer in the great outdoors.